For everyone who has been asking the question, “Will there be a chassis for VIA’s PX10000G,” the answer is, “Why, yes.” I have a brief introduction to the first fanless Pico case available, the Serener GS-L08. And, just to pique your interest further for the PX10000G, we have another Pico case coming, too (but more on that later). The GS-L08 is incredibly small. You hold it in one hand, amazed that an entire computer sits directly in your palm. It is light, weighing only 2.3 lb. It is quiet (of course, it is fanless) and when clutching the smooth, metal frame, I can’t help but feel surprised by the density and presence the computer exudes, despite its minute footprint. 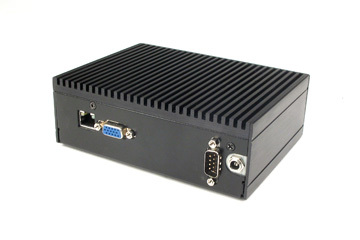 Size: The chassis measures 146.5 mm (W) x 50.0 mm (H) x 109.0 mm (D) (5.77″ x 1.97″ x 4.29″). 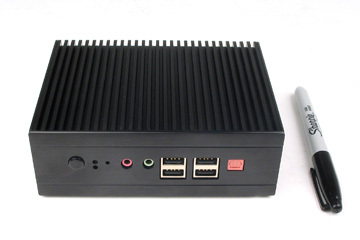 Compare that to our smallest Mini-ITX case, the Casetronic C134, with dimensions of 177.8 mm (W) x 50.8 mm (H) x 254 mm (D) (7″ x 2″ x 10″) and the GS-L08 is still considerably smaller. It has front access to 4 USB 2.0 ports, 1 S/PDIF port, 2 audio jacks (speaker, mic), and a power button. The back has LAN and VGA (output comes directly from the back panel I/O) and a COM port and DC jack. Not too bad for a little computer. The heat sink on the PX10000G is removed and replaced with a heat pipe. With the cover off, you can see there isn’t much room for additional components. Every cable has its place. 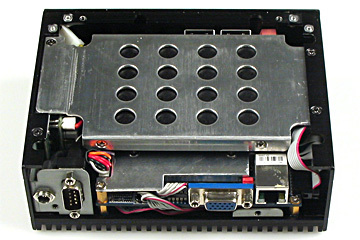 The case is opened from the bottom with the hard drive bracket on top and the mainboard underneath. A fanless system set up does require some skill in assembling a heat pipe configuration, but now, even more so, in this scenario. Performance: We installed Windows XP, tested the video, and determined it to be quite a decent PC for embedded or industrial applications. It doesn’t have mounting brackets like its big brothers, the GS-L05 and GS-L06, but I think this computer can easily find its way into many applications where that is not a strict requirement. The case costs $140. For the mainboard, case, 512MB RAM, 40GB HDD, power supply, and a build and test, the system runs about $526.00. We’ll eventually provide a more detailed review of the system. Any questions, please contact our technical sales team at 802 861 2300 or sales@logicsupply.com.